E. Cape traditional leaders seek help from Public Protector to remove moratorium - SABC News - Breaking news, special reports, world, business, sport coverage of all South African current events. Africa's news leader. Busisiwe Mkhwebane says they've advised the traditional authorities to lodge a formal complaint. Traditional leaders in the Eastern Cape have called on the Public Protector, Advocate Busisiwe Mkhwebane, to help them remove a moratorium preventing the placement of new traditional authorities. The moratorium was placed by the provincial Cooperative Governance and Traditional Affairs department nine years ago. Traditional leadership in the province say it has weakened their authority and stalled service delivery. Traditional authorities have been meeting with some of the chapter nine institutions as part of Human Rights month commemoration. The interaction comes at a time when there’s discontent and a view that traditional leadership is being undermined and they seek urgent intervention. Chief Landubuzwe Ngwekazi, Traditional Leader, says that they have been engaging the department for nine years to no avail. He says because of this moratorium, there’s a dire shortage of traditional leaders in the province as they are not replaced when they die. Mkhwebane says they’ve advised the traditional authorities to lodge a formal complaint. She says they will follow proper procedure, write to the national department and launch a full investigation if warranted. 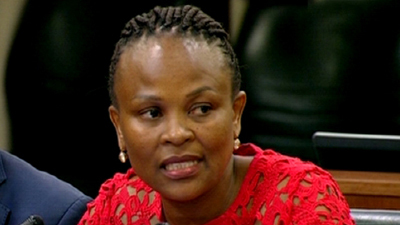 The Public Protector is also investigating relations between municipalities and traditional authorities in the country, with a focus on the issue of land. This entry was posted on 19 Mar 2019,06:50PM at 6:50 PM and is filed under South Africa. You can follow any responses to this entry through the RSS 2.0 feed. Both comments and pings are currently closed.